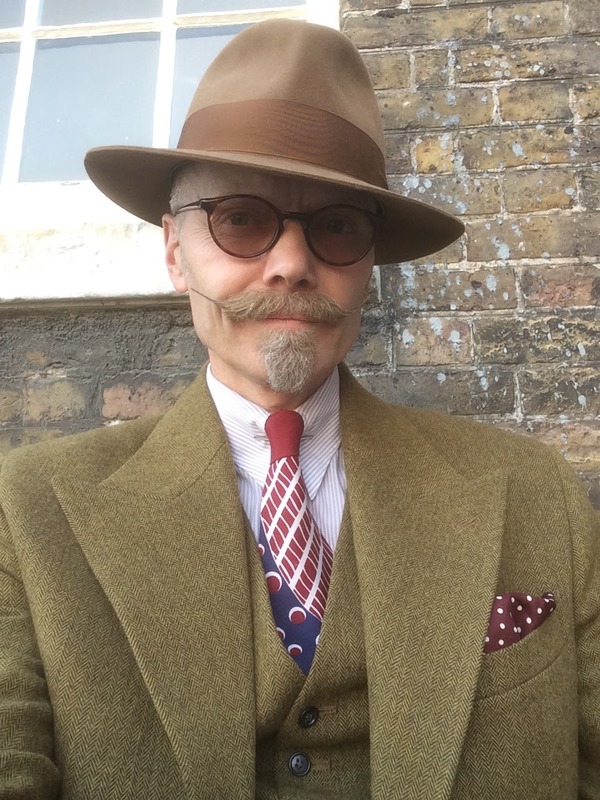 I've had a request from someone for some tips on keeping a stiff upper lip so to speak. 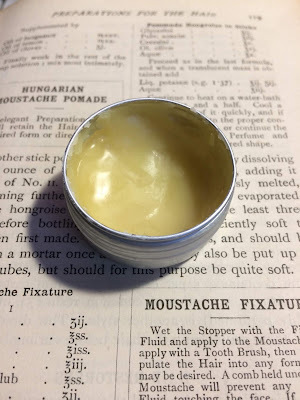 Moustache wax is a matter of taste. Not wishing to court controversy, but I find the available preparations do not suit my needs when it comes to keeping dagger like points to my moustache so I make my own, in batches of various strengths.. I shall divulge shortly, but first I shall digress slightly. and 'Materia Medica'.... yes I know... fascinating hobby! 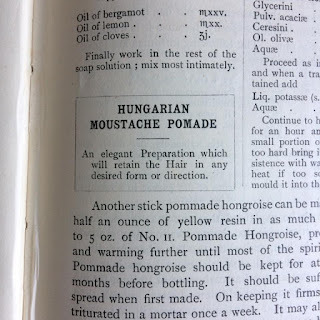 Anyway, within the pages of 'The Chemist and Drugist Book' for 1911, I found this. with a tooth brush, then manipulate the hair into any form that may be desired. 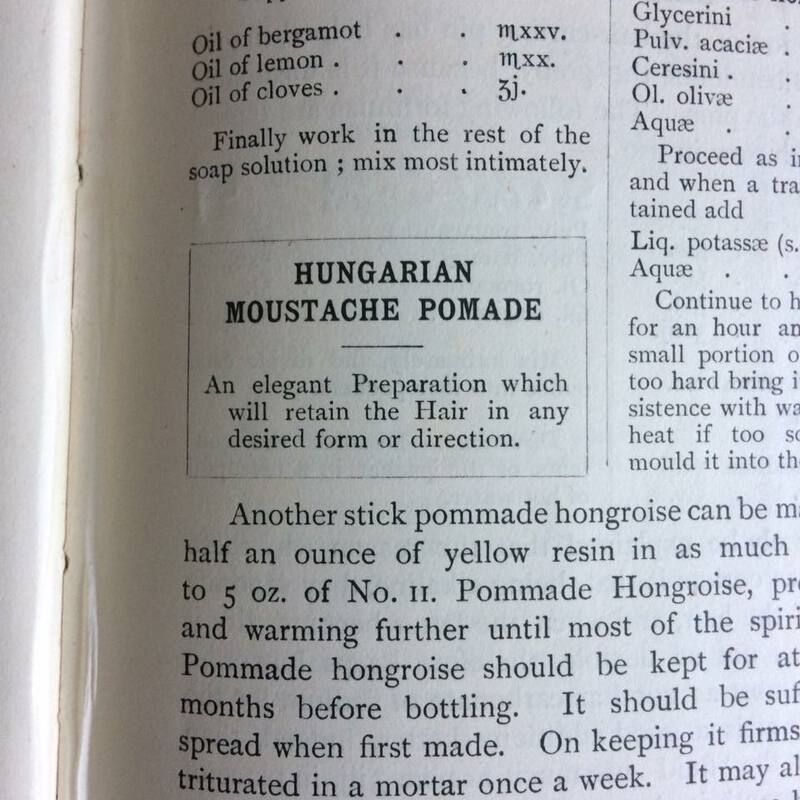 A comb held under the moustache will prevent any of the fluid touching the face. If any of the fluid gets on the face or fingers a little oil will instantly remove it"
Essence of Jockey Club !!!!! I have yet to discover what essence of jockey club is, though I know I have now wish to have it anywhere near my top lip! The proportions depend on how stiff you want the end product to be, personally I like it good and stiff! I use 2 thirds bees wax, one third Soya wax, and a few drops of the other oils. Everything gets gently heated in a metal jug until in liquifies, )should really use a water bath but life it too short), a few drops of the essential oils are added at the end. The liquid is then poured into small metal tins to cool and solidify. Now I keep my tin on top of the central heating pump, that way its nice and soft for application, but once applied to the lip weasel, cools and stiffens a treat. Moustache usually pointy and intact first thing in the morning from the previous days application. Keeping it in the front trouser pocket usually keeps it warm enough for a further application. From application to the above photo was three days... just a twirl in the morning to set it right. Jockey Club was actually a well known 19C men's perfumed preparation, very much like today's colognes and edts etc. Oriza L Legrand, an amazing perfumery in Paris have revived the scent from their old formula books and sell bottles of it now. I'm sure that I've got a formula for it somewhere in one of my old perfume books. I shall have to try and find it when I'm more awake.